Powerlifters DezJ'nae Hodge and Colt Baranowski were named to the Academic All State Elite Team by the THSWPA and THSPA, respectively. 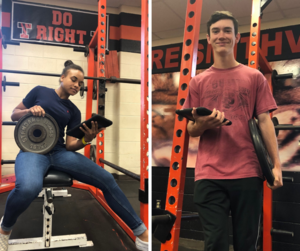 DezJ'nae qualified for the Regional Powerlifting Meet and Colt Baranowski won the Regional Meet in the 114 lb category advancing to the State Meet where he finished in 9th Place. Congratulations to these student athletes for their success 'on the field' and in the classroom!